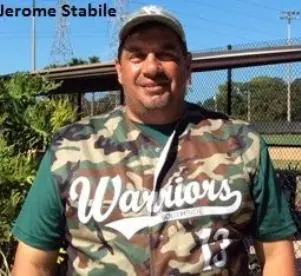 November 5, 2016 – Carpenter Complex, Clearwater, Florida – The Southside Warriors used a couple of untimely Top Hat fielding errors and a balk call in the bottom of the eighth inning to score two runs and seal a 5-4 come from behind victory. Mike Capolla and Joe Ferrara reached on consecutive errors by the Top Hats third baseman to lead off the inning. Southside manager Jerome Stabile laid down a perfect sacrifice bunt to advance them both into scoring position. Frank Bungevino ripped a long sacrifice fly ball to right field to tie the game. Top Hats pitcher Rich Lee was then called for a balk on the next pitch that scored Ferrara with what turned out to be the game winning run. The Warriors scored first in the contest plating a run in the bottom of the first inning on a Joe Demiri sacrifice fly that scored shortstop Matt Kinsella who had reached on a fielder’s choice, advanced to second on an error and then stole third base. Connecticut scored all four of their runs in the top of the second inning keyed by RBI singles from Rich Burns and Steve Simone along with an RBI fielder’s choice from Manager Bob Manowitz. That lead held till the fourth inning when the Warriors chased Top Hats starting pitcher Eric Brady with two runs. Brady went 3 2/3 innings before yielding to lefty Rich Lee who held the Warriors scoreless till the bottom of the eighth. Manager Jerome Stabile started on the hill for the Warriors and pitched one batter into the third inning before giving way to left hander Frank Bungevino. Bungevino pitched seven scoreless frames to earn the mound victory for Southside. Southside had only four hits in the game but used three sacrifices, five walks, a hit batter and four Top Hats errors to score their five runs. Connecticut had nine hits in the game, three by shortstop Wally Hurd ( two singles and a double) while leadoff hitter Bill Bardes reached base three times via walks. Skipper Stabile praised Bungevino by saying, “Hard fought battle today. Frankie came in after I struggled. He threw 16 scoreless innings this week including the seven today for us and was outstanding.” The team wore camouflage jerseys during the week. Stabile explained that he works at Southside Hospital in New York and that they have a Wounded Warriors Project. The hospital sponsored the jerseys in their honor which is really cool. Top Hats manager Manowitz was gracious in defeat stating, “It was a tremendous tournament, my team showed a lot of heart coming from behind in both the quarter and semi finals. The baseball gods just didn’t shine on us in the eighth inning. Two errors and a balk and to lose on a balk call was tough. I have been playing with Rich for a long time and I can’t ever remember him getting called for a balk.” He said he was very proud of his team. They have won two championships in the tournament in previous years. This is their first loss in a championship game. Manowitz said they would be back next year to battle for another title. Southside’s Craig Smith was named the tournament MVP. I spoke to his mom in the stands before the game and she gave me prophetic words stating that he was the best player on the field. Mothers always know best! Southside went 4-1 earning the number one seed from Division Two. They outscored their opponents 43 to 23 during the week. Connecticut also went 4-1 and qualified as the number two seed from Division One. They outscored their opponents by a count of 53 to 21 during the five games. Southside defeated the South Atlantic Twins 9-7 in the quarter final round and the Atlanta Giants 14 -2 in the semi finals. Connecticut topped the Susquehanna Valley Hitzmen 11-10 in the quarter finals and the Del Val Bombers 12-9 in the semi finals.